1 "Hamburg Symphony Orchestra/Karl Jergens"
2 "Hamburg Symphony Orchestra/Otto Schmidt"
3 "Olympia Symphony Orchestra/Peter Mattos"
4 "Hamburg International Philharmonic Orchestra/Wilhelm von Luden"
5 "Berlin Symphony Orchestra/Alfred van Weth"
Once more, David Gideon and ReDiscovery take delight in teasing us. In the late 1950s and 1960s, cheap classical music LPs proliferated. Many obviously were targeted toward inexperienced or unwary consumers. Sometimes the cover art screamed "buy this record to show your good taste!" At other times it was assembled from stock photographs only peripherally related to the music. The labels had names such as Crown, Rondo, Rondo-lette, and Tops American Home Library. Obscure conductors with forbidding foreign-sounding names were paired with similarly named orchestras, apparently under the assumption that if it came from Europe, it had to be good. It turns out that many of these conductors and orchestras never really existed. A man named Paul Lazare, operating out of Hamburg, assembled a large catalog of classical performances and licensed them to other labels, who often issued them pseudonymously. Thus, many of Lazare's recordings involve the Hamburg Symphony Orchestra, and conductors such as Arthur Winograd and Hans-Jürgen Walther. The same performance could be released under different pseudonyms on different labels. And sometimes, a performance actually recorded in a place other than Hamburg was credited to a Hamburg orchestra. Since then, discographers have been trying to sort out who did what to whom, and where. 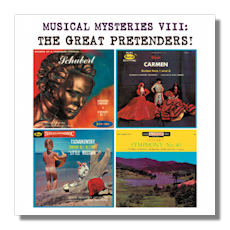 Gideon and colleagues have been fascinated with this topic for several years, and a new set of "musical mysteries" has been solved in ReDiscovery's booklet. Don't expect me to tell you "whodunit," though! The performances here are, understandably, a mixed bag. The Carmen LP promised (threatened?) "Suites Nos. 1 and 2," with no singers listed, but this is a 50-minute collection of the opera's greatest hits, with voices. It is full of oddities. The singers use the original French text, but the chorus sings in Italian (and lustily! ), so no points for guessing where this performance originated. Only four singers are included, so poor Carmen has to muddle her way through the act II "Gypsy Song" without Frasquita and Mercedes, and in any case, she gets to sing only two verses of it! (She is similarly isolated during the "Card Song," weirdly identified on the LP as "Jeu de cartes.") No loss, though, because this mezzo-soprano, with a voice that is both boomy and shrill, sounds more like Auntie Carmen than Bizet's alluring gypsy. Her high notes could make local dogs howl. I will reveal that the tenor is Edward (better known as "Eddy") Ruhl, and he is a bleating Don José. The Micaëla is nice but tentative, and the Escamillo is more insinuating than blustery – rather classy, actually. Pedestrian conducting completes a recording that is so bad that it is rather enjoyable. The Tchaikovsky "Little Russian" is only slightly better. The orchestra is indifferent (or worse) and the performance is plodding – although it is nice to hear the finale not played as fast as humanly possible. The same movement (at 10:00) also features one of the more unpleasant brass "clams" ever committed to LP. Apparently the LP also included a false start to the finale, not edited out! The ReDiscovery remastering corrects this, but presents the false start (complete with someone's comment about it) as a bonus track. For some reason, the first movement is monophonic; the rest is in (dull) stereo. The remainder of this collection is pretty nice, offering us sturdy, enjoyable performances that do not misrepresent the music. Because it is not one of his most popular symphonies, it is a pleasant surprise to encounter Schubert's Third at all, and even more pleasant to find that "Jergens" and the "Hamburgers" (but not really) are so capable. The Mozart is similarly agreeable – a reading from another era, stylistically speaking, but very listenable even today. In the waltz excerpts from Der Rosenkavalier, it is clear that the conductor is sympathetic to the opera's mood, and to the Viennese style in general. The reading is a little kitschy, but then again, so is Der Rosenkavalier! All of these recordings have been sourced from LPs, carefully cleaned, de-clicked, and remastered by Gideon. The sound is good, except in the aforementioned Tchaikovsky, and in the Carmen, which becomes congested at the original side ends. This entertaining pair of CD-Rs is available at www.rediscovery.us for just $15, with shipping included.